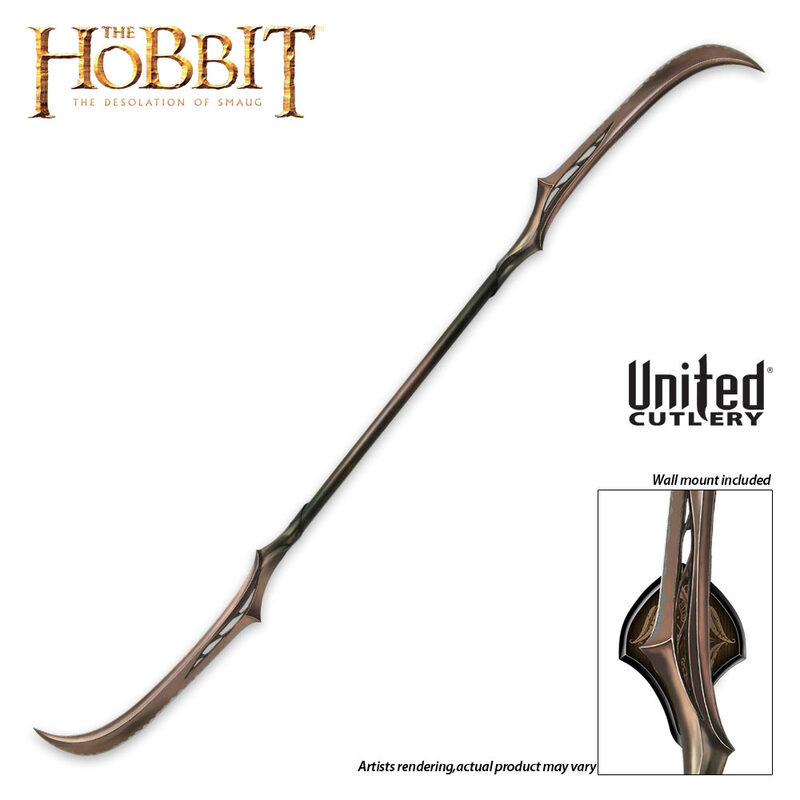 Hobbit Mirkwood Polearm Replica - United Cutlery | BUDK.com - Knives & Swords At The Lowest Prices! The Woodland Guard are the soldiers of the Elvenking, sworn to protect and watch over the northern lands of the great forest of the Woodland Realm. Among their weapons is this polearm, crafted with a greenwood shaft and two curved Elven blades forged with bronzed steel with a Silvan steel edge of superior strength. This replica features bronze-finished cast stainless steel blades and a hardwood handle shaft. It is presented with a wooden wall display featuring a Wood Elf graphic motif. There are two things that i look for when buying anything for my collection. 1.) How well everything stays together 2.) If it has a nice weight to it (not too light to feel fake and not too heavy to lift). I have to say that this excels in both of these categories and this beauty is absolutely perfect! It's VERY well made and has a very nice weight to it. This beast of a weapon is definitely my top dog in my collection and it'll definitely be hard to top it. I HIGHLY recommend this to anyone that is thinking of purchasing it. I can't believe this was finally released. It is a great piece whether your collecting from the Hobbit line or not. The blades are dark, darker than pictured and when compared to the Tauriel Knives, and I was told this was for the whole run, but still giving it 5 stars as I am not disappointed. I have been waiting on this masterpiece for so long! Finally it is released! Worth the money and wait! I ordered it the day it was in stock and it arrived in just one week! Great condition! Excellent work of art and a must own!